This is a book I discovered quite by chance while looking for information on Sir Andrew Wood. The book is in poor condition as the ink has leaked through the pages and thus some pages are a bit of a challenge to read. I do however believe that the subject of the book is of interest and so we're making it available here for you to read. IT may be necessary to explain that the detached historiettes of which this volume is composed, are authentic, and are prepared from the notes which I have had occasion to make in the course of historical and other reading, while engaged on my military romances; and the success of a similar work, "The Cavaliers of Fortune,: has induced me to make a second attempt of the same kind. In the brief history of the Constable Buchan are detailed some of the events of a war in which the Scots engaged for the defence of France, events which are not related in ordinary histories of Scotland. It is a little record of the faith and valour of our forefathers in France, whose kings did well to request that the Scottish standard might be bordered by the double tressure of lilies, in memory of the old and to them extremely useful alliance. Some of these sketches have already appeared in the pages of the United Service Magazine, &c.
The Memoir of General Wolfe appeared in that periodical and was prepared from various sources; among others, the records of the War Office, and of the 12th, 20th, and 67th Regiments. Since then a volume has been dedicated to his achievements by another hand. 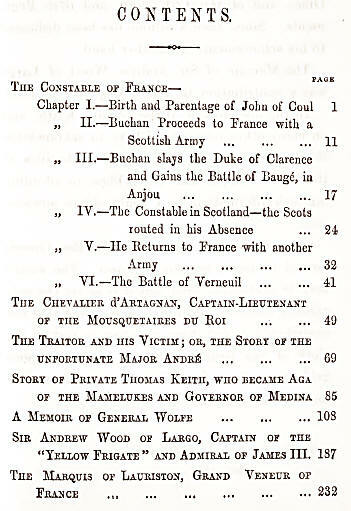 The Memoir of Sir Andrew Wood of Largo was a contribution to Tait's Magazine in 1853. In the instances of Wolfe, Andre, Keith, and on many other occasions, I have to acknowledge the courtesy and kindness of the authorities at the Horse Guards and War Office, in affording me such information as I could obtain nowhere else. 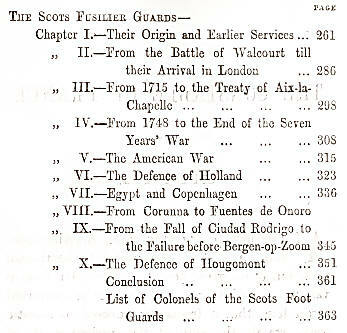 The achievements of the Scots Fusilier Guards formed to me a tempting subject. The record here is necessarily brief, but it is as yet the only existing historical account of a regiment that has contributed its full share of valour to sustain the glory of the British arms on many a famous field—from the battles of the Covenant even to those of the Crimea.